The Structure of a typical Spiral Galaxy. Galaxies are most often found in clusters and are thus subject to gravitational forces from their neighbors. The relative motion that results from these interactions causes deviations from the cosmological principle called bulk flow. Measuring the peculiar velocities enables cosmologists to calculate the masses of interacting galaxies. Using this technique scientists can estimate the total density of matter in the Universe. During the recombination epoch, the Universe had cooled sufficiently for nucleosynthesis to occur. However, this process produces only a few elements, and looking at the abundance of these elements today is indicative of the rate of nucleosynthesis and the amount of baryonic mass that exists. Now, when scientists today look at the bulk motions of galaxies, they find that their velocities are far too great to be generated solely by the baryonic matter inferred from nucleosynthesis. There must therefore be large amounts of non-baryonic DM in these galaxies, generating gravitational forces large enough to explain the velocities observed. Furthermore, it is found that during recombination, baryonic matter was not able to provide the density needed to form stars and galaxies because it was ripped apart by photons. Thus DM must have provided the required density, which resulted in the formation of stars and galaxies. Light rays from the two stars are bent by the Sun's gravity. 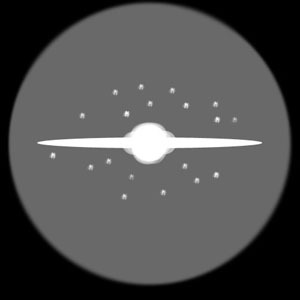 As a result, the stars appear to be farther apart than they actually are. In his theory of General Relativity, Albert Einstein predicted that the path of light can be bent by the presence of a gravitational field in an effect known as gravitational lensing. This phenomena was verified by Arthur Eddington during the solar eclipse of 1919 and marked important experimental confirmation of Einstein's theory. The light from a distant galaxy is bent by the intermediary field created by a nearby cluster. Any large galaxy or galaxy cluster can act as a gravitational lens; the light emitted from objects behind the lens will have a characteristic angular distortion and, because of the lens's poor optical quality, pronounced spherical aberration. 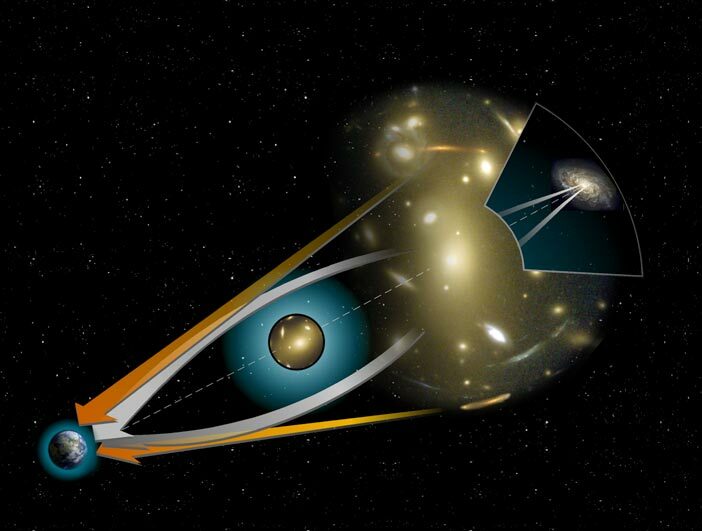 By measuring the degree of gravitational lensing, cosmologists can calculate the mass of the intervening body as well as its approximate density distribution. This method is a particularly powerful one for studying the effects of dark matter.